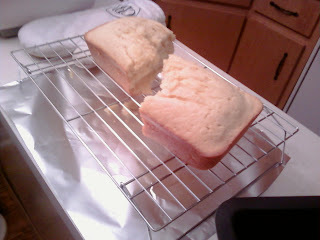 This lemon pound cake was both a resounding success, and a complete failure. 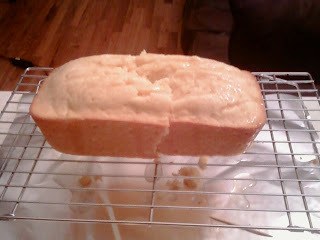 The success was in the flavor and texture of the cake, and the failure was in, well, me. Everything was going pretty well - the recipe was simple, easy to mix up, it baked up beautifully in my loaf pan, and then, I left it to cool for five minutes in the pan before removing it. ...yeah. It slipped through my fingers, crashed onto the countertop, and broke in two. Determined to salvage it, I forged on with the next step, which was poking it all over with a toothpick and pouring on the glaze. Denial is a strong force. Now, this wouldn't have been so bad, if the cake had split down the middle. 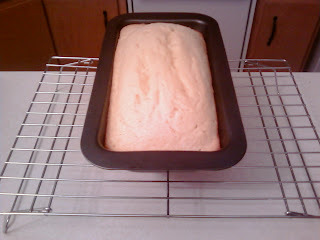 I mean, it is a loaf cake, I was planning on slicing it up anyway. But no, that would have been too easy. Except, if you look closely, you can see that it split in almost an S pattern, managing to ruin about four would-be slices, instead of just one. Well, those four slices made excellent, um....snacks. And when you just put it back into the loaf pan like so, can anyone tell? Anyone? Works for me. Now all this is getting in the way of the cake itself, which was wonderful. Sweet, light, and soft, this is a recipe I'll definitely try again, with different flavorings and mix ins. And a firmer grip. 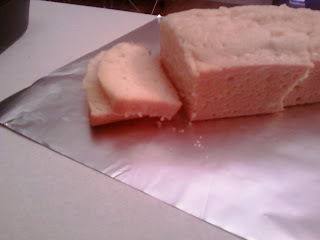 Tip of the Day: If a frosted cake gets cracked or broken, don't despair. Sandwich the pieces together with frosting before covering it, and nobody will know. Add in eggs, one at a time, and beat until well mixed. Gradually mix in flour, baking powder, salt, baking powder and lemon rind. Pour into 9x5" greased loaf pan, and bake at 350F for 55 to 60 minutes. Glaze: mix sugar and lemon juice in a saucepan until combined. 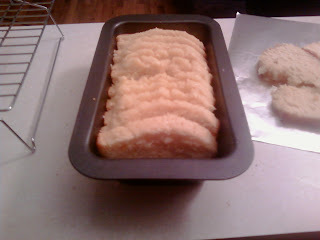 Cool in pan for five minutes, then turn out onto cooling rack. 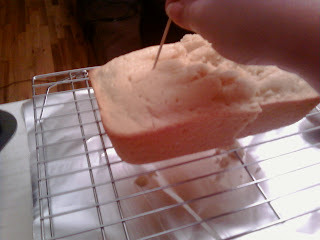 Poke the top with a toothpick, and while still warm spoon glaze on top.